Paul Lambert chose a 3-4-1-2 formation and the big surprise was the inclusion of both Christian Benteke and Darren Bent together for just the second time this season, and the first since September. In the buildup to this match Newcastle boss Alan Pardew talked about the need to turn the corner on the past and he did that by handing debuts to new signings Yoan Gouffran and Moussa Sissoko, while welcoming back from injury, defender Steven Taylor for the first time in two months. For a team who hadn’t won away at all this season, Newcastle started the game in a confident manner and their two new signings made a significant impact right away. Much was made about Sissoko’s debut (more on him shortly) but Gouffran was lively from the beginning, interchanging with Jonas Gutierrez regularly. The movement of both wide men become contagious as Cisse, when Newcastle had the ball, would also swap with each player to create overlaps and bring any of Villa’s back three out of position. The movement of the two wide men, in particular, created a massive problem for Villa’s full backs who never got forward and gave them licence to stay forward. Matt Lowton and Joe Bennett spent the entire first half pinned deep worrying about the movement of Newcastle’s front three, offering nothing in attack. 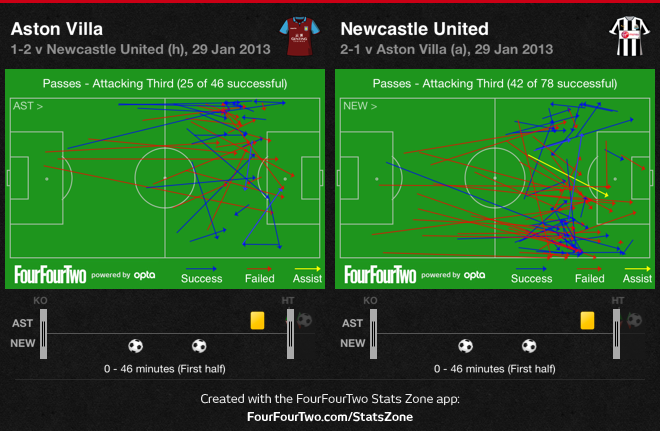 With no width coming from Villa’s front three at all, it meant Newcastle completely dominated the first half pushing Villa’s centre backs deeper. Ashley Westwood and Barry Bannan were outrun in midfield and were clearly under instructions to not get too deep, which meant the area between the lines was exposed. 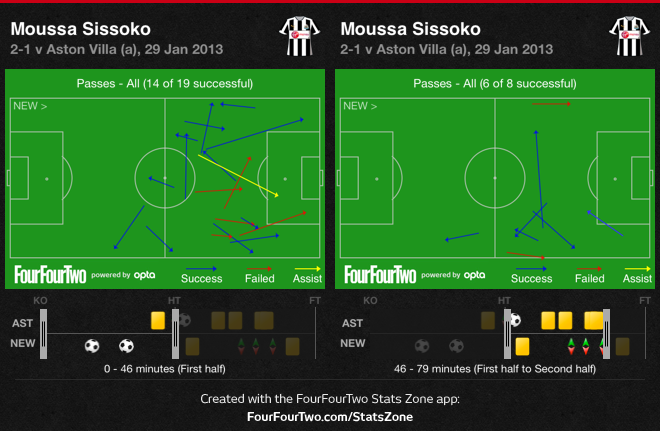 This is where Sissoko took control. As early as the sixth minute he found himself with a lot of time on the ball, only to blaze it over. Four minutes later he again picked up the ball up in that area of the field and sent a delightful chip over the back three defenders on to the rushing Papiss Cisse who was clear on goal, only to be wrongly adjudged offside. Nine minutes later Villa weren’t so lucky as Sissoko again got into space, supplied a brilliant diagonal ball that took out all of the defenders and into the path of Cisse who did the rest. On 31 minutes it was 2-0, this time Yohan Cabaye got into the area exploited by Sissoko, took a touch after Ron Vlaar’s clearance and hit a curling half volley into the corner of Brad Guzan’s goal. It was a brilliant strike that ensured their dominance was reflected in the scoreline. Villa were lifeless in their 3-4-1-2 and incredibly, in the first half alone, allowed 78 passing attempts in the final third, with Newcastle completing 42 of them. 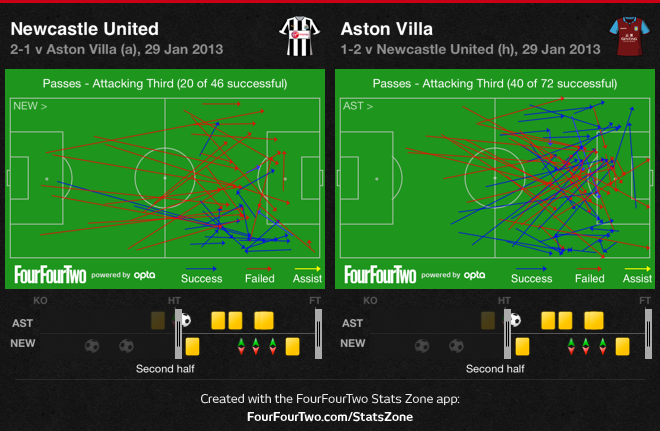 Villa’s passing in the final third in contrast represented the dominance from the visitors. The home side clearly needed a change. Paul Lambert waited until half-time to do it, bringing on Andreas Weimann and Gabriel Agbonlahor for Joe Bennett and Darren Bent. The change of system led to a change in tempo and a massive change in momentum for the second half. Westwood and Bannan sat deeper to take away Sissoko’s threat, while the substitutes brought much-needed pace and direct play out wide. Their introduction immediately pushed Gutierrez and Gouffran deeper. Jonas is actually very good at defending his flank and Pardew stopped rotating them, keeping him on the left side up against Weimann. This meant most of Villa’s successful attacks in deep areas came down their left through Agbonlahor. Gouffran showed little appetite for the fight but right back Mathieu Debuchy had a fantastic game, despite losing the occasional one-on-one battle and harshly being called for a foul in the box on Agbonlahor. Benteke stroked home the penalty and suddenly Villa Park was rocking. The change of system helped, by taking away Newcastle’s strengths, but the goal lifted Villa, a young side who ride momentum both ways more than most, and they went on to dominate the second half. Tim Krul produced a wonderful save on Weimann after Benteke had sent an intelligent cross field ball into his path and Nathan Baker saw his header blocked by the excellent Fabricio Coloccini. Pardew did what he could to alter the flow of the game, sending on Shola Ameobi for James Perch and pushing Sissoko into a deeper role but the Frenchman tired and eventually was replaced by fellow new boy Mapou Yanga-Mbiwa. After a fantastic game-changing performance in the first half, Sissoko drifted out of it in the second but it was still an all-around impressive debut. Ultimately, though, Newcastle couldn’t muster anything going forward and the pass completion stats, much like the first half (only in reverse) showed just how the game changed in the second half. Incredibly, despite getting dominated in the first half, Villa ended the match with a better accurate passing rate in the final third (55%) than Newcastle (50%). Newcastle held on despite being outplayed in the second half and that will give them tremendous confidence going forward. Pardew will have concerns about how his team struggled to cope with Villa’s intensity and pace in wide areas but all-in-all this is the result he has been looking for to turn the tide. Lambert’s Villa have now lost four straight games at home and scored just one goal, a penalty. They could have scored more in the second half but once again another slow start cost them in another crucial league match. It would be very brave if the Scot goes back to a formation of three at the back again in the near future.